A paper published today in Atmospheric Research determines the net effect of clouds in the Mediterranean is a large negative-feedback cooling effect at Earth's surface and at the top of the atmosphere. All climate models falsely assume the opposite, i.e. a positive-feedback warming effect from clouds and water vapor, which is one of many reasons why the overheated models have been falsified with confidence levels exceeding 95%. The paper finds a -15.9 W/m2 cooling effect from clouds at the surface, which by way of comparison is more than 11 times greater than the IPCC alleged CO2 increased forcing of 1.68 W/m2 since 1750, as shown by the AR5 chart below. The IPCC also estimates cloud adjustments due to aerosols as only about -0.5 W/m2, which may be greatly underestimated since cloud formation requires the presence of aerosols. 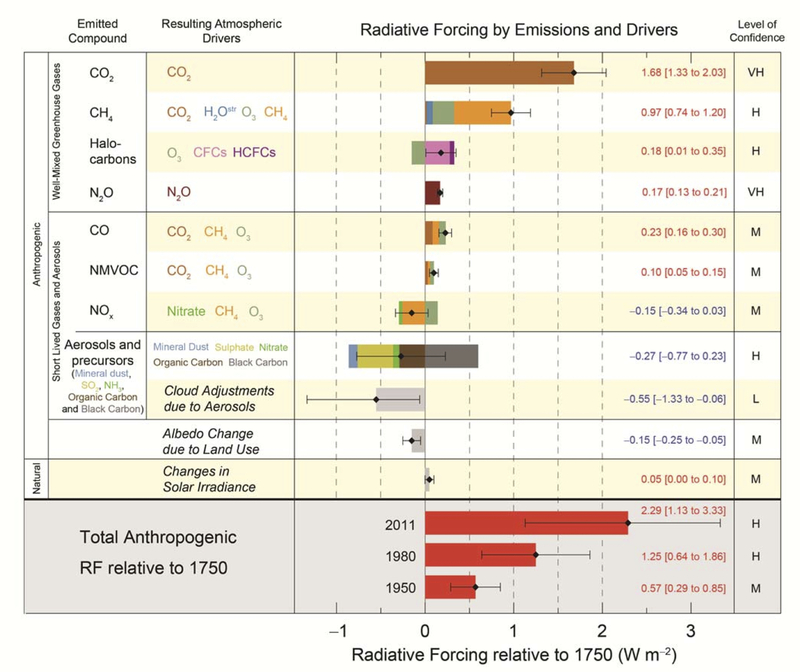 IPCC AR5 chart showing alleged CO2 forcing increased 1.68 Wm-2 since 1750. Figure from the paper showing the net cooling effect of clouds in black, cooling due to blocking solar radiation shown in blue, and smaller greenhouse gas water vapor longwave IR radiation shown in red. CRE = Cloud Radiative Effect. This paper estimates the cloud effects on the shortwave, longwave and all-wave radiation budget of the Mediterranean basin. The shortwave cloud effect exceeds the longwave one at both surface and top of the atmosphere, thus producing a cooling. Low-level clouds play a primary role for all-wave radiation at the top of atmosphere while high clouds at surface. The cloud effects on the shortwave (SW) [solar radiation], longwave (LW)[infrared from greenhouse gases] and net all-wave radiation budgets of the Mediterranean basin were computed using a detailed radiative transfer model together with satellite and reanalysis data for surface and atmospheric properties. The model radiation fluxes at TOA were validated against CERES and ERBE satellite data, while at the Earth's surface they were validated against ground-based GEBA and BSRN station measurements. The cloud radiative effects were obtained for low, middle, high-level clouds, and for total cloud cover. Overall for the basin, the effect on solar radiation is to produce radiative cooling at the top of atmosphere (TOA) and at the surface that more than balances the warming effects on terrestrial radiation. The result is a net radiative cooling at TOA and at the surface, equal to − 18.8 and − 15.9 Wm− 2, respectively. The low-level clouds are most important for the TOA budget through significant SW reflection and little LW emission to space. High clouds play an important role in net surface cooling (− 9.8 Wm− 2) through the combination of SW reflection to space and a much reduced LW warming effect at the surface. The geographical patterns of the effects are mainly characterized by a strong south to north increasing gradient. 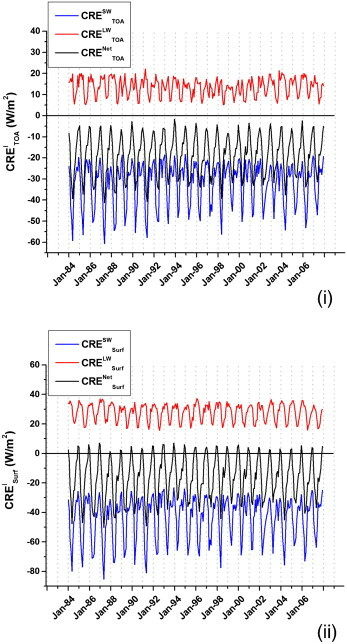 The seasonal variation of net radiative effects is dominated by solar radiation with maxima in spring and minima in winter. I like many would like to comment here but Wordpress identies are not allowed so it seems. Yes, I am who I said I was and I am log in to Wordpress now, but this site (like all google sites) fail Wordpress ID passing. How do you propose I "FIX IT!"? I have no control over that, but you can always comment as anonymous and leave your website/Wordpress identities in the comment if you wish. This is a paper about the effect of clouds on the radiation budget. The IPCC figure is concerned about the effect of aerosols on clouds on changing the radiation budget since the pre-industrial. You cannot make a direct comparison between the numbers in this paper and the numbers in that figure from the IPCC report. It is entirely possible for the net effect of clouds to be strongly negative, but for the effect of aerosols on clouds to only be slightly negative. Indeed it would be surprising if this was not the case. "This is a paper about the effect of clouds on the radiation budget. The IPCC figure is concerned about the effect of aerosols on clouds on changing the radiation budget since the pre-industrial." Of course it is, and that's why the caption to that figure says "IPCC AR5 chart showing alleged CO2 forcing increased 1.68 Wm-2 since 1750." Same is obviously true for the IPCC alleged cloud adjustments due to anthropogenic aerosols of ~ -0.5 W/m2 since 1750. "You cannot make a direct comparison between the numbers in this paper and the numbers in that figure from the IPCC report. It is entirely possible for the net effect of clouds to be strongly negative, but for the effect of aerosols on clouds to only be slightly negative. Indeed it would be surprising if this was not the case." I put the IPCC RF chart in this post to give readers a sense of proportion with respect to the -15.9 W/m2 cooling effect of clouds, "which is more than 11 times greater than the IPCC alleged CO2 forcing of 1.68 W/m2, as shown by the AR5 chart below." There is nothing wrong with doing so. Apparently, you once again have misinterpreted my posts and think that I am claiming the change in cloud RF since 1750 is -15.9 W/m2. I clearly am not, and have stated the absolute cloud RF is -15.9 W/m2. You also completely miss the main point of the post, which is "All climate models falsely assume the opposite, i.e. a positive-feedback warming effect from clouds and water vapor, which is one of many reasons why the overheated models have been falsified with confidence levels exceeding 95%."